Donor figures can be found in many objects made of different materials in the Burrell Collection. Two examples on display are a beautiful limewood carving of the nativity scene and a tapestry showing four scenes from the life of the Virgin. 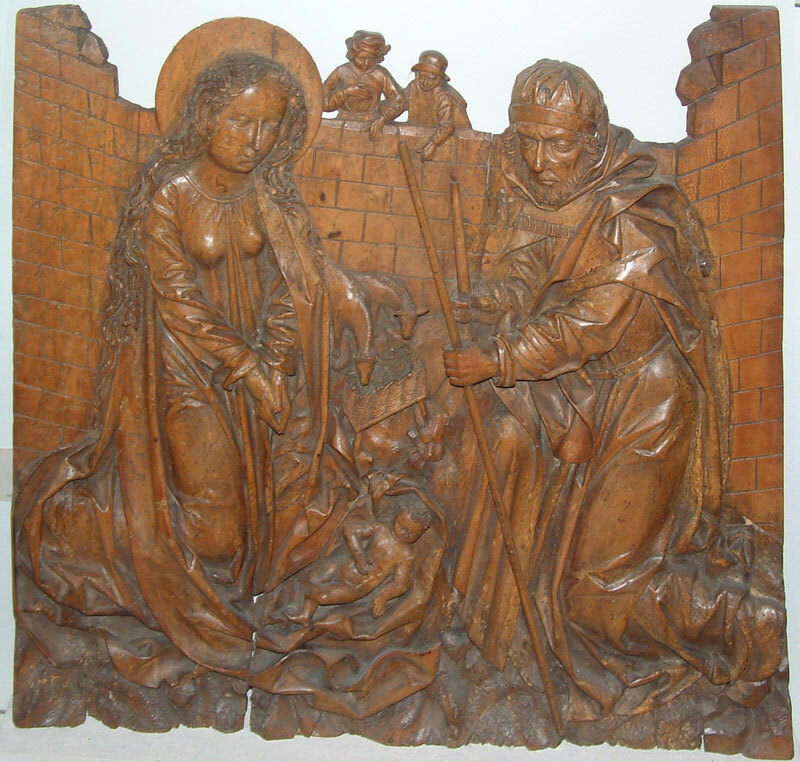 The limewood carving of the nativity scene is from the wing of an altar-piece and dates to around 1500. 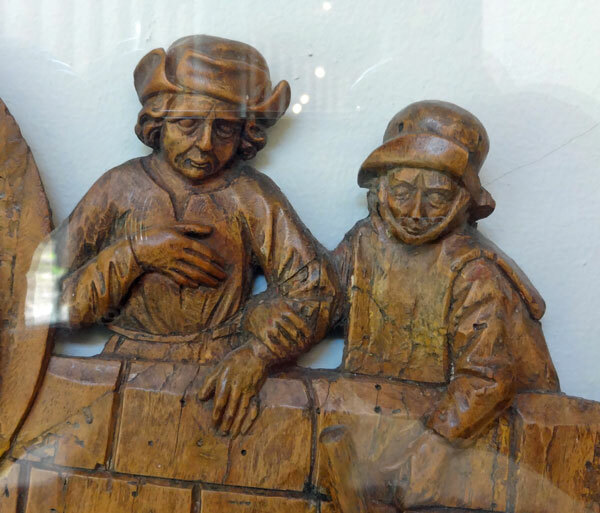 It comes from an area in southern Germany (Franken) which was famous for its very fine limewood carving. Limewood has a very close grain and cuts easily and cleanly. Other woods, such as oak, which was more widely used in other parts of Europe, have a strong grain and are very tough making it exceptionally difficult to carve in the same way. The donors here are shown in a realistic pose on top of the wall looking down on the activity below. How different they are from Siegfried von Gelnhausen and his wife! The Life of the Virgin tapestry is a fine and well-preserved example of tapestries woven in Switzerland in the late 15th century. 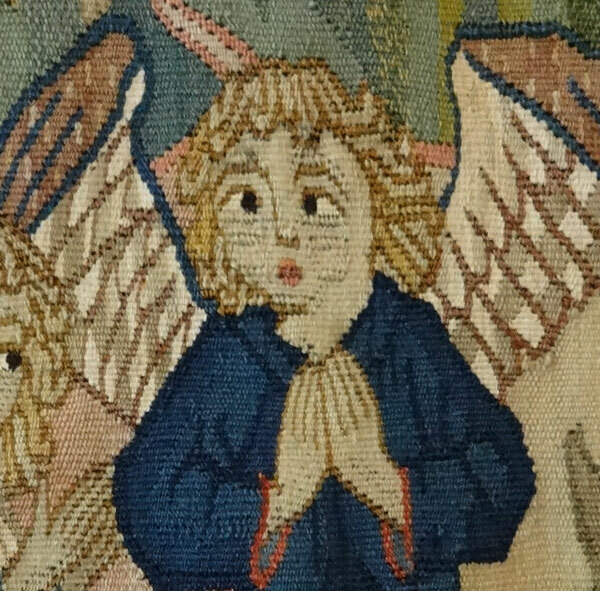 It was originally an altar frontal from a convent. The Visitation: Mary meets Elizabeth, mother of John the Baptist. The tree between them is symbolic of life growing within them. The Nativity: Here Joseph also appears as Mary kneels beside the manger. Above this scene the shepherds tend their flocks and are told the news by an angel. The Adoration of the three kings from the east. One points to the star at the top of the tapestry. All bring their precious gifts and the third king has knelt down in front of the Child and his mother. In reverence to the Child he has taken off his crown. The Presentation in the temple. Mary and Joseph (holding two doves for offering and carrying a long candle) stand in front of the altar and the priest, holding the Child, is behind it. The four scenes are shown without any formal division and are framed by various scrolls with the texts in Latin based on St. Luke. 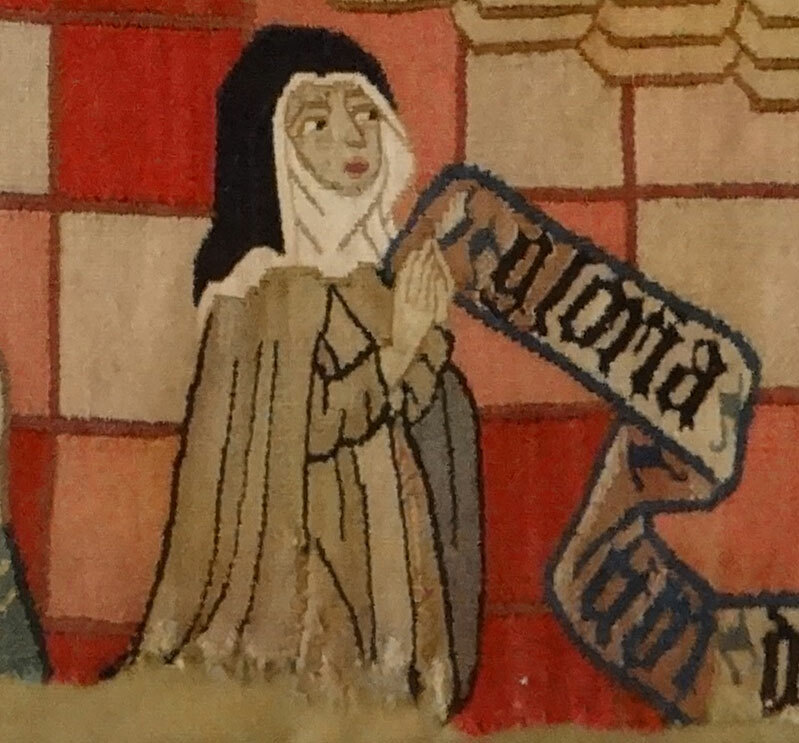 The little nun in the foreground of the tapestry is the donor. She may have woven it herself, or it could have been part of her dowry when she entered the convent. Her pose kneeling in prayer is quite similar to the representation of donors in stained glass . As in many tapestries from this period, the white of the eyes has been accentuated by the use of fine white linen. Below is an endearing cross-eyed angel! 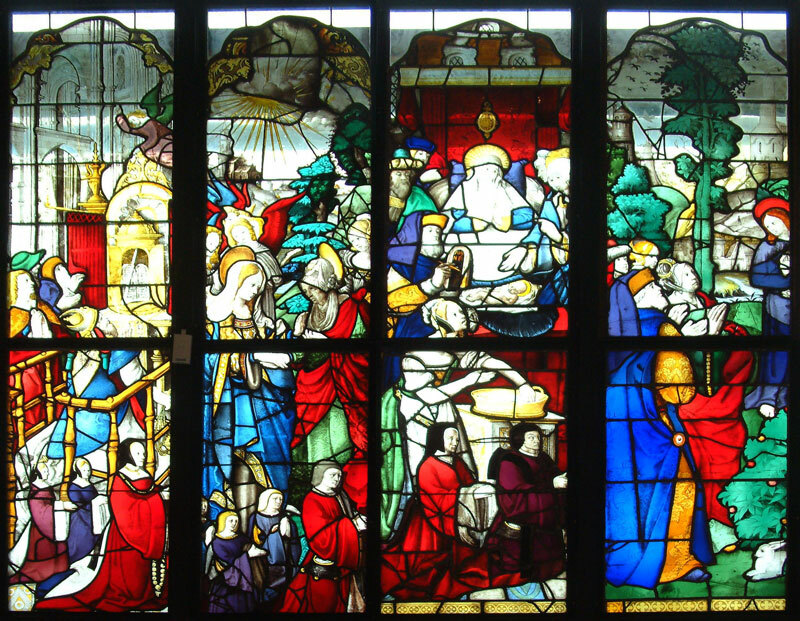 By the 15th century, glass painting had evolved greatly. By applying the paint in thin layers and washes, the subtle effects of shading and texture could be created. This might be achieved by using different binders for each layer, or by firing between applications of paint. Paint could be removed before it was fixed to the base glass using sticks and brushes of differing stiffness to create still more effects. Sophisticated cross hatching can be seen in the Princess Cecily panel from the Becket window in Canterbury Cathedral. 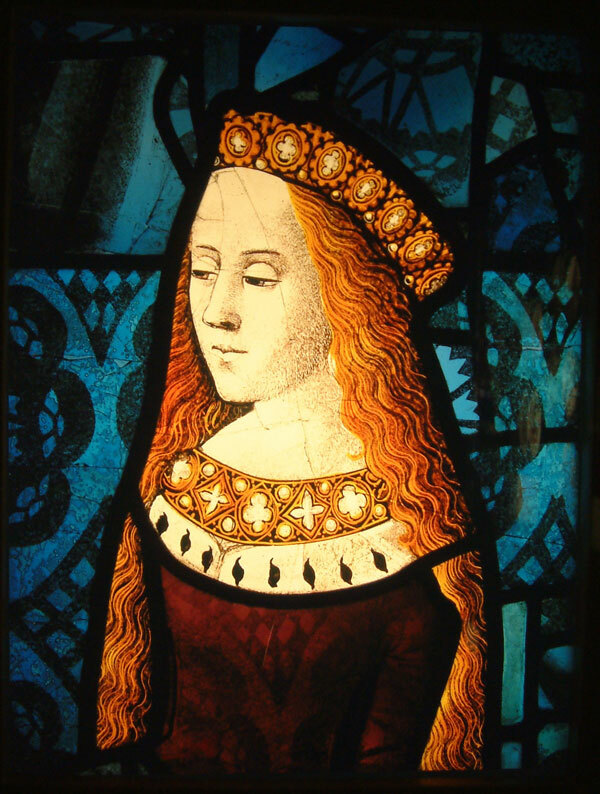 Princess Cecilia or Cecily (1469-1507), third daughter of Edward IV, married after 1482 John, Viscount Wells, whose arms appear in what remains of the Becket window. The Royal Family now occupy a middle range of the window which was mostly destroyed on December 13th, 1643 by a minister wielding a pike “on the top of the citie ladder, near sixty steps high”. 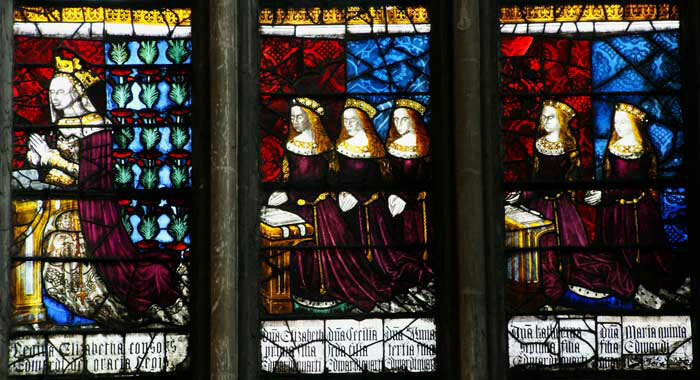 The figure of Princess Cecilia, kneeling between her sisters Elizabeth and Anne as she appears to-day in the north window of the northwest transept at Canterbury, is a modern replica. The Siegfried von Gelnhausen and his wife panel is an excellent example of donor glass, but there are several others on display at the Burrell Collection, in a variety of materials. In this blog, we are going to look at some other examples of donors in stained glass. As was mentioned in our blog on glass painting, The Beatrix van Valkenburgh panel is the earliest example of English donor glass in existence. It was originally believed to be from Oxford but has since been attributed to the Norwich Greyfriars. St. John being boiled in oil. The writing of the Book of Revelation on the Island of Patmos (note the Book arriving from above in a shaft of light and the seven headed dragon from revelation 12. Below is St. John’s apostolic symbol – an eagle holding an inkpot in its beak. The raising of Drusianna to life. It shows a funeral procession with bearers in blue and purple robes emerging from a building with a bier from which a shrouded figure rises; St. John stands on the right, hand raised. The donors are at bottom – they are the Bigar de la Londe family. They are arranged in what was the traditional order of importance at the time; father, followed by two sons, mother, in yellow and four daughters, two in blue and two in red, and all coifed in black. The Bigar de la Londe family were important in Rouen and are recognisable by the colours of their red and white heraldic surcoats. Often, other heraldic emblems such as in the Siegfried von Gelnhausen panel would be included such as a shield, either with or without the actual donor being represented. I wonder whether we would have recognised them from their faces. The Vision of Zacharias: Zacharias is dressed as a priest in blue chasuble. He kneels within the altar rails in the temple, a censer in his right hand, before the Tables of the Law and the Rod of Aaron; the Archangel in pink with green wings appears above the altar. The Visitation shows the Virgin Mary attended by five angels saluting Elizabeth in a landscape of green trees and castle beneath a burst of rayed light. Birth and naming of St John shows Elizabeth in red curtained bed and the infant St. John laid on a blue velvet cushion between two women and two men; in the centre foreground is a midwife and on left Zacharias with tablet inscribed IOHNES. St John taking leave of his parents occurs at sunrise in a landscape with mill stream and towers among green trees; the saint in purple gown turns his head towards Zacharias and Elizabeth who are accompanied by a girl and youth. 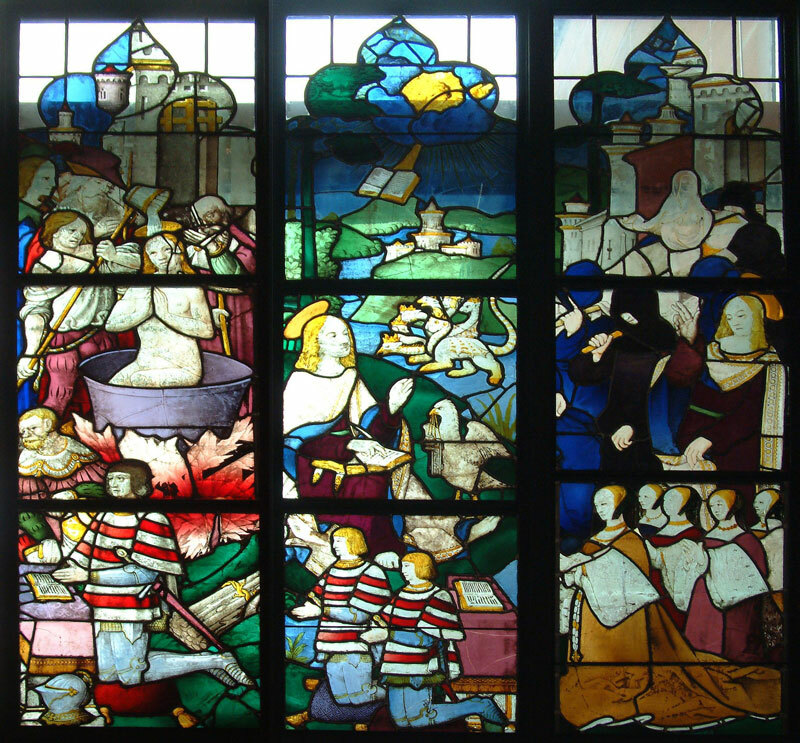 The donors in this window are unidentified, but are probably a wealthy Rouen merchant with his wife, son and daughter-in-law, and six grandchildren. These four lights and four others on display showing scenes from the life of St John the Baptist are presumed to have been brought to England by John Christopher Hampp in 1802. Hampp was a Norwich weaver and merchant, who travelled Europe buying stained glass windows which he brought back to Britain for sale to collectors. 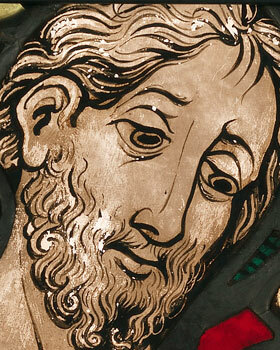 A significant proportion of the stained glass in museums and collections were saved thanks for Hampp. From 1820 until 1946 the glass was in the windows of the long gallery on the first floor of Lord Bagot’s home, Blithfield Hall. 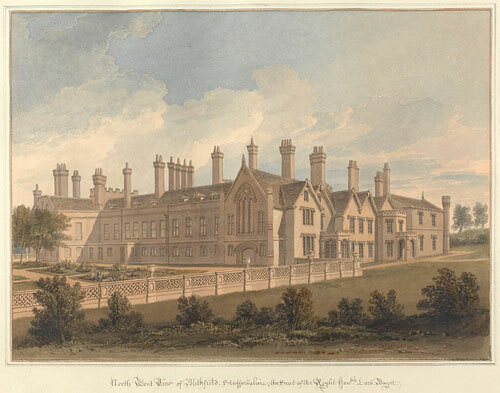 “North West View of Blithfield; Staffordshire, the Seat of the Right Hon’ble, Lord Bagot,” watercolour, by John Buckler (1770-1851) and John Chessell Buckler (1793-1894). 20 1/2in. (52.1cm). Courtesy of the Paul Mellon Collection, Yale Center for British Art, Yale University, New Haven, Connecticut. What is glass paint made of? 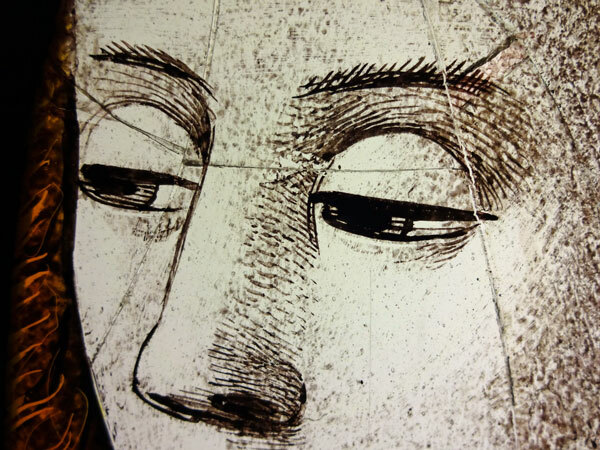 Glass paint is applied to the glass surface to manipulate the light and create details such as faces and drapery. One of the main components of glass paint is glass ground to a fine powder. This is mixed with iron or copper oxides (like rust) to create shades of black or brown, and a flux to help lower the melting temperature of the paint when fired in a kiln. This is then mixed with a liquid such as water, vinegar or oil, and a binder such as gum arabic to help the paint stick to the glass base. This is painted onto a shaped piece of glass cut out of a suitable colour. The painted glass is then placed in a kiln and heated to around 650˚C – 680˚C until the glass paint melts and the base glass begins to soften, permanently fixing the paint in place. 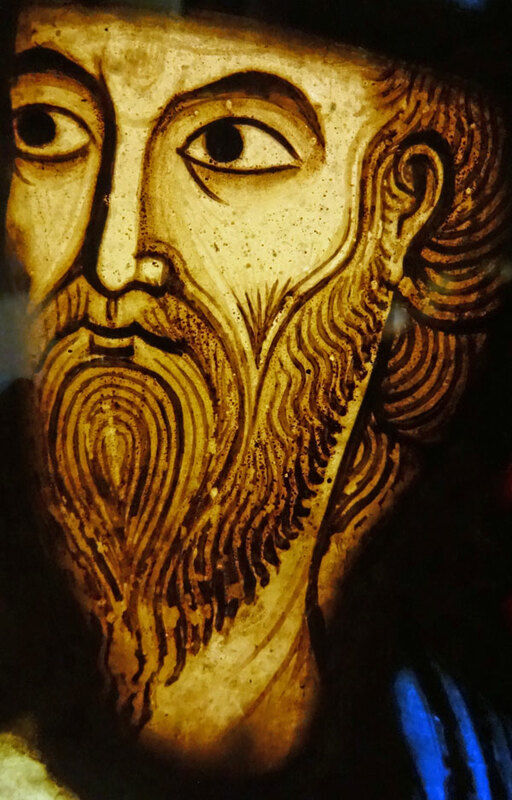 Like all technologies, glass painting has evolved over the centuries, so in this blog, we will look at examples over time, starting with the 12th century from which our earliest examples in the collection date. Very few examples of stained glass survive from before the twelfth century, and these are often small fragments from archaeological finds. Perhaps one of the most influential examples of 12th century stained glass is the glazing scheme for the Abbey of St. Denis, near Paris, dating to the 1140’s and installed under the direction of Abbot Suger. Previous Churches from the Romanesque period had massive walls with small windows to support the forces created by the roof. The large expanses of wall inside were often decorated with paintings showing people and scenes from the bible. With the development of buttresses and flying buttresses, the new Gothic architecture allowed much bigger buildings and large soaring windows. The paintings now moved to fill these great windows in the form of wonderful stained glass. Saint Denis was one of the first places to show what could be done with stained glass on this larger scale. 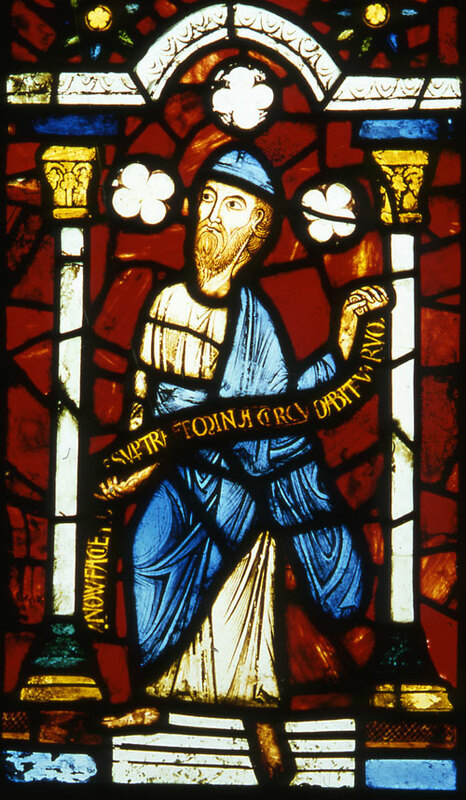 The Burrell Collection has superb examples of 12th century glass on display, in particular a rare surviving stained glass panel from St Denis depicting St. Jeremiah, dating to the 1140’s. The Prophet Jeremiah holds a scroll with the words from the Book of Jeremiah, ch. 31, v. 22 saying, “the Lord hath created a new thing in the earth, a woman shall compass a man”. Perhaps the key element in creating these pictures is the technique of glass painting, essential for turning patches of coloured glass into vibrant pictures depicting people and events. The details of the face and clothes, the scenery and text, are all created with the use of paint. With paint, the artist could control the amount of light passing through the glass, creating shadows and 3D effects and bringing realism and animation to the images. The beautiful and artistic painting is what makes the Boppard Windows so special. 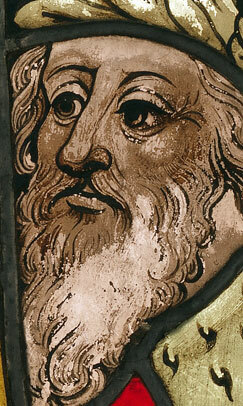 This can be clearly seen in the detail of Jeremiah’s face. The panel “Beatrix van Valkenburgh” is English and dates to 1275. Beatrix van Valkenburgh was the third wife of Richard, Earl of Cornwall, King of the Romans (“Rex Allemannie”). 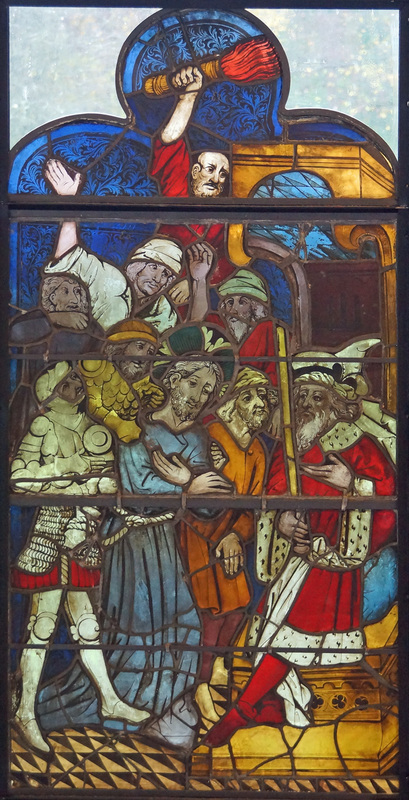 The panel is the earliest known example of English donor glass in existence and the earliest surviving example of the Oxford School of Glass Painters. Sir William Burrell was very fond of this panel due to its links with his home, Hutton Castle. King Edward I stayed at Hutton Castle, when it was just a simple keep in 1296, the night before he laid siege to Berwick-on-Tweed. Accompanying King Edward was his First Cousin Richard Plantagenet, Beatrix van Valkenburg’s step-son. It is considered likely that the two would have shared the top bedroom in the castle, as that would keep them as far away as possible from the noise and smells on the ground floor. Sir William Burrell seemed very pleased when he explained this link between the stained glass and his home, in a letter to Wilfred Drake, having installed the panel in the top floor bedroom at Hutton Castle.